Athletes with various physical and intellectual disabilities and impairments are eligible to compete in the Paralympic sport competition. However, wide ranging degrees of impairment can lead to an imbalanced competitive environment for athletes. Accordingly, the Paralympic movement institutes a classification system intended to ensure fair opportunities and a level playing field. The athlete classification systems of the Paralympic Games aren’t conceptually novel to para-sport, but are fundamental to the very existence of the movement (often misconstrued as a massive sub-category of sport). In reality, the para-sport classification system is a carefully and artificially delineated section of the sport spectrum, defined by degrees of impairment. The concept of classifying degrees of impairment itself requires somewhat arbitrary lines to be drawn to be able to categorize an athlete as a “para-athlete.” The threshold for eligibility is that an athlete must have an “impairment” sufficient to fit within a designated category or classification, but how much “less able” do they need to be1? By strict definition, the person who finishes second in a sport contest is “less able” than the person who won – this clearly can’t be the bar, but where does that bar get set, and who sets it? The Paralympics is a sporting event, but also an event that creates a unique requirement for participants and spectators to address and discuss issues around disability, which can create discomfort, but at the same time catalyze personal and societal growth. The Paralympic Games are fundamentally defined by classification systems that first determine which athletes are eligible to compete in the Games, then group those athletes into sport classes, all to ensure a level playing field. 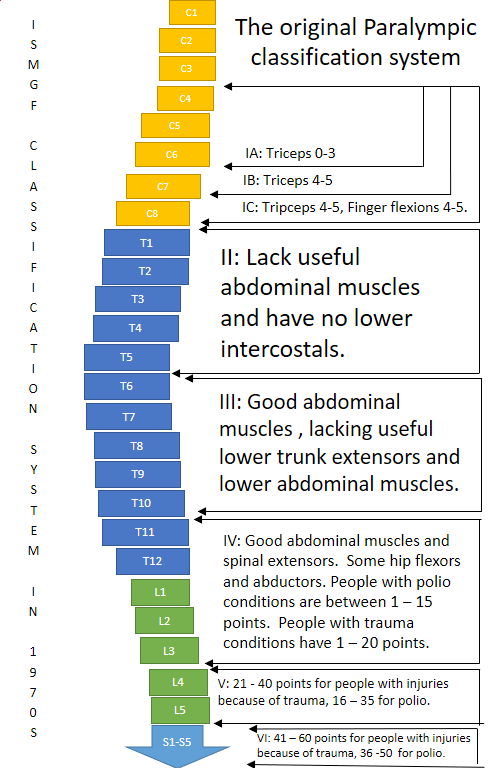 Classification minimizes the effects of physical impairment, allowing athletic ability and sporting excellence to be the determinative factors, and for para-athletes, understanding the classification rules can be as important as understanding the technical elements of their sport. Although fundamental to the concept of the Paralympics, the classification systems of para-sports are no different than gender categories or weight classes, but the complex and often counter-intuitive categories can strain the ability of audiences to fully engage, because understanding the classification systems is necessary to fully appreciate para-sport, in the same way that knowing the rules of any sport is. Understanding and discussing classification requires frank conversations about the practical effects of a disability or impairment in the context of a sport performance, which simply can’t happen without setting aside or stripping away societal preconceptions about disability that are sometimes deeply entrenched. The Paralympic movement and the sport classification system itself evolved in tandem, with the Paralympics emerging from a rehabilitative exercise for patients (many former military) recovering from spinal cord injury, to a global celebration of sport and opportunity for athletes representing a wide spectrum of disabilities. Concurrently, the classification systems developed from drawing dividing lines based strictly on medical-based elements, into a sophisticated system based on “functional ability”, paralleling in many ways developing notions of disability as a social construct rather than based on medical diagnosis. The change involved moving beyond a simple objective measurement of an impairment, instead accounting for the actual effect the impairment would have on athletic performance taking into consideration the unique elements of the specific sport or event. An example is the difference in effect that an upper limb amputation would have on a swimmer versus a runner – the impairment is identical, but the functional effect is different because of the nature of each of the sports’ physical requirements. Para-sport originated in 1944 in Great Britain, when Dr. Ludwig Guttmann opened a spinal rehabilitation facility at the Stoke-Mandeville hospital, with sport as a component of the medical course of treatment. Over time, and largely due to fact that the patients were almost exclusively young men anxious to return as much as possible to active lives, sport as rehabilitation evolved to recreational sport and then to competitive sport. This in turn drove the need to create classifications to ensure that victory wasn’t secured almost by default by the least impaired athlete. At the time, the sport was literally being run by doctors and nurses at a hospital, so the medically diagnosed level of spinal cord injury provided a very linear way of determining which muscles functioned and which didn’t and made sense to the people running things, so a series of classes developed based entirely on the medical diagnosis. By the 1988 Paralympics in Seoul, Korea, athletes with spinal cord injuries were being categorized into 3 classes for athletes with quadriplegia, and 5 classes for athletes with paraplegia. Amputees and other athletes with impairments not caused by spinal cord injury were in a separate category called “Les Autres” (which regrettably translates to “the others”). The classification systems in para-sport aim to provide a more level playing field, in some instances even ensuring the competitive importance of athletes with more significant impairments. 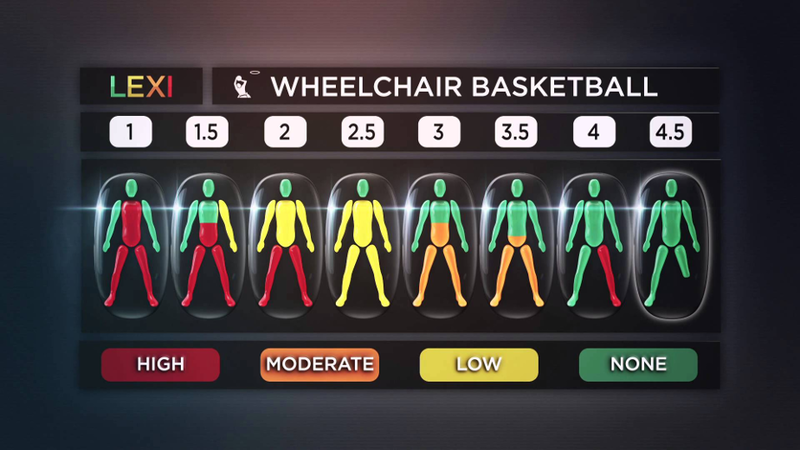 Wheelchair basketball is an example – the classification system assigns points to each player, from 1 to 4.5 – players with higher point totals have greater functional ability, and no more than 14 points can be on the floor at any time. The limit creates an interesting strategic element that goes beyond just adding up the points on the floor, where development of players with the least amount of functional ability is of paramount importance to the success of the team – it’s universally accepted in the sport that success at the top levels is nearly impossible without a roster that includes talented and well-developed low-point players. This translates into concerted efforts to identify, recruit, and support athletes with significant impairments – in a very real way, there are advantages to being a low point player. Turning stereotypes about disability on their head by promoting the notion that disability can be a competitive advantage is intellectually exciting to people who ascribe to the notion that disability is often a social construct. Imagine the dramatic strategic changes that would happen in basketball if the “impairment” of being “short” in the context of basketball were addressed by assigning a .25 point bonus to every point scored by a player under 185cm, and .5 bonus to players under 170cm. The rules are what we make them, and rules can be written in sport (and in life) that level the playing field, often making the game better and more thrilling to be involved with. The 2015 IPC Athlete Classification Code2 (Code) is the governing document currently in force for the classification system, replacing the 2007 version with the intention to continuing to refine the standardised policies and procedures across sports. The Code, along with five international standards3, a set of Model Rules4, and a series of Models of Best Practice5 form the body of guiding documents and principles that allow the International Federations (IFs) to adopt and adapt as necessary to meet the unique needs of each sport. A major change in the 2015 edition of the Code is the inclusion of s. 8, Data Storage and Data Collection, and the International Standard for Classification Data Protection6. Issues around privacy and data protection have rightly assumed a position of importance as a governance issue in sport, and the medical nature of the data around classification increases the need for robust and sophisticated protections. One of the best resources to gain a working understanding of the classification system is LEXI7, a ground-breaking info-graphic system developed primarily for television audiences by triple gold-medalist Giles Long MBE (see video explainer8). LEXI essentially identifies what the event is, who is in it (defined in terms of impairment), and why the group is together in the sport class. LEXI modules for 8 of the 20 summer Paralympic sports have been developed: swimming, athletics, wheelchair rugby, wheelchair basketball, sitting volleyball, seven-a-side football, cycling, and table tennis. The classification system first determines eligibility based on enumerated grounds and that a minimum level of impairment is met, then groups those eligible athletes into sport classes. This process attempts to harmonize the impact on sport performance within the groupings to ensure a level playing field within each classification, so that success is determined by sporting ability. The minimum level of impairment is determined by sport and is not uniform, because as mentioned above, the functional effects of disability varies from sport to sport. Not all sports include all the enumerated grounds - sports like Judo and Goalball are only open to athletes with visual impairments, and participation in Wheelchair Rugby (at one time known as Murderball) is limited to athletes with quadriplegia9, wheelchair users who are paraplegics10 are not eligible. Athletics and Swimming have the most classifications, with 49 and 28 respectively, whereas some sports have only one open classification. Some team sports address varying degrees of impairment with points systems – as mentioned above, wheelchair basketball has a sport-specific classification system that assigns points from 1 to 4.5, whereas the winter sport of Para-Hockey has only one open classification11. Sport opportunities in the Paralympic stream are available for athletes with visual, intellectual, and physical impairments, which subdivides into 8 impairment types: impaired muscle power, impaired passive range of movement, loss of limb or limb deficiency, leg-length difference, short stature, hypertonia, ataxia, and athetosis. Visually Impaired athletes are eligible when damage is present to one or more of the components of the vision system, which can include impairment of the eye structure, the optic nerve/optic pathways, or of the visual cortex, and subdivide into 3 classes. Athletes with an intellectual impairment are eligible in a limited number of sports/events, must be impaired with regards to intellectual functions or adaptive behaviour, and must be diagnosed before the age of 18 years, and are not subdivided into classes. As one of the largest and oldest sports in the Paralympic movement, Athletics (also known as track and field) has undergone some of the most comprehensive revisions of its classification system. Voluminous data from results over almost seventy years of competition provides a firm foundation to extrapolate the practical effects on performance of different levels of impairment, and the “black and white” nature of the way sport results are measured or timed means that the data is relatively unaffected by judging or refereeing. Sport specific elements to ensure that the classifications are functionally equal exist in B-class events, often involving technical elements or equipment. Blackout headgear devices are used in sports like goalball to allow all three B-classifications to participate in matches together. Specialized technical equipment like sonic balls for goalball that have been standardized over time, with some brands now boasting of sanction from the International Blind Sports Association (IBSA), and athletes in Athletics are allowed to customize the tethering devices that connect them with guide runners within limits set out in the rules. Because the technical elements to distinguish between classifications is left to each International Federation (IF) to decide, the IF’s are also responsible for training and certifying “classifiers” - persons responsible for determining each athlete’s designation. Evaluation takes place prior to competition, and normally is a process that happens over time, and in a similar trajectory to the usual progression of an athlete through the ranks of sport. Athletes are usually classified when they enter the sport and depending on how developed para-sport is in their home jurisdiction, the evaluation could be done by a well-intentioned volunteer, or a top international classifier with decades of experience. As they progress through to the upper levels, their classification is either confirmed or modified at the national and international levels. As athletes move up the competitive ranks, fitness levels, better fitting equipment, and a host of other elements can affect functional ability and require re-classification. Classifying athletes is a skill like any other, and occasionally, first-time international athletes who have been incorrectly classified at the domestic level are “classed up” into a less impaired classification, when assessed by more experienced classifiers, which can turn medal hopefuls into also-rans. Countries will often either send an athlete to a competition where qualified international classifiers are known to be attending or bring a classifier to evaluate the athlete prior to their first international competition to avoid any surprises. Classification can be challenged, with protest and appeals procedures defined under the IPC Classification Code, at Section 5, which specifies that appeals procedures must be in place, but leaves it to each IF to implement their own specific rules in compliance with the IPC International Standard for Protests and Appeals. If the appeals, protests, or changes by classifiers happen during the Paralympics, decisions by the IF can be appealed by application to the Court of Arbitration for Sport that sits during Olympic and Paralympic Games under the Ad-hoc Rules that ensure speedy resolution of matters that have the potential to affect results, guaranteeing decisions within 24 hours of filing. Many impairments are progressive over time, triggering periodic review – some athletes will undergo formal evaluation several times over the course of a career. Classifiers monitor athletes during competition, and if they make observations that could affect an athlete’s classification, they have the authority to recommend changes to the IF, or order mandatory review on a one-time or repeating basis. The concept of a functional assessment to determine classification injects a subjective component that is absent in a medical diagnosis-based system, opening it to potential abuse. Getting correctly classified can make or break an athlete’s career, and like any aspect of sport that provides the potential to cheat, those who are inclined to, will attempt to secure an unfair advantage. Accusations of cheating can arise when an athlete “on the bubble” between classifications ends up in the more impaired category and dominates the field, often coming from disgruntled competitors who feel that they’re being unjustly relegated off the podium. The issue made it all the way to a Parliamentary Inquiry in the UK in 201712, when accusations of systemic cheating were levied by athletes at each other, and allegations of using threats of re-classification to intimidate, harass, and control athletes were directed against some of the National Federations. The attention and seriousness given to the matter seems indicative of the increase in popularity of Paralympic sport in the UK after London 2012, with many Paralympic athletes signing lucrative endorsement contracts. Parliament recognized that cheating by manipulating the classification system could yield fraudulent results in the same way as performance enhancing substances or match-fixing do in Olympic-stream sport, warranting a similar governmental response. An infamous situation arose at the Summer Paralympics in Sydney, when Spain was found to have deliberately chosen to register athletes with no impairment in the category for intellectually impaired athletes, specifically to win medals and drive funding for their domestic Paralympic movement. The gold medal winning basketball team was found to have only 2 of 12 players eligible to compete and was stripped of its medal, with a number of Spanish officials and bureaucrats resigning in disgrace. This outrageous scandal highlighted unique difficulties in determining eligibility of intellectually impaired athletes and resulted in a suspension of the entire category for almost a decade, while efforts were made to establish an effective classification system. A series of tests were standardized and approved by the IPC, and the 2009 IPC Swimming European Championships saw the return of the category to competition in the Paralympic stream13. The transition from the medical model to the functional system coincided with a doctrinal shift by the disability community at large from a medical-model definition of disability to a notion that “impairments” are often social constructs. As mentioned above, wheelchair basketball is an example where the system itself constructed a sport where more impaired athletes were made necessary and valued by design. The intermediary of equipment is often integral to constructing sport environments that reverse traditional notions of disability. When fans of Paralympic sport discuss athletes and performances, it’s common to hear variations of “they’ve got the perfect disability for that sport/distance/event”. It is putting it lightly to say that the notion of a disability being described as “perfect” for anything, let alone a physical task is rarely heard elsewhere. The earth-shattering part is that it’s a true statement – having a specific physical situation that would normally be seen to be an “impairment”, can be an actual physical advantage for the purposes of Paralympic competition. Disability is not fundamentally equal to disadvantage. 1† Each sport sets its own minimum impairment threshold for eligibility in their classification rules, referred to as “minimum disability criteria”. 9† Quadriplegia, occasionally referred to as tetraplegia, is a spinal cord injury in the cervical sections of C1-C8. The result is some degree of paralysis in all four limbs—the legs and arms. In Wheelchair Rugby, spinal cord injuries are the most common, but players may also qualify through multiple amputations, neurological disorders or other medical conditions. See chart above for specifics. 10† Paraplegia occurs in spinal cord injuries at sections T1-L5 of the spine. Paraplegics are able to fully use their upper limbs, and the extent to which their lower limbs are affected can vary, with some experiencing only minor mobility issues. See chart above for specifics. 11† Para-Hockey allows anyone who meets the “minimal disability” requirement to compete, and does not sub-categorize based on functional ability. The practical effect is that athletes with more involved disabilities are not frequently seen at the elite level. 14† Additional Sources: IPC Athlete Classification Code: Rules, Policies and Procedures for Athlete Classification, 2015, International Paralympic Committee, Bonn. Athlete Reference Guide To the 2015 Athlete Classification Code, 2017, International Paralympic Committee, Bonn. Classification Model Rules for Para Sports Model Rules consistent with the 2015 IPC Athlete Classification Code and accompanying International Standards, 2017, International Paralympic Committee, Bonn. 2015 IPC Athlete Classification Code Models of Best Practice: National Classification, 2017, International Paralympic Committee, Bonn. International Standard for Eligible Impairments, 2016, International Paralympic Committee, Bonn. International Standard for Athlete Evaluation, 2016, International Paralympic Committee, Bonn. International Standard for Protests and Appeals, 2018, International Paralympic Committee, Bonn. International Standard for Classifier Personnel and Training, 2016, International Paralympic Committee, Bonn. International Standard for Classification Data Protection, 2016, International Paralympic Committee, Bonn. Jeff Adams is a 6 time Paralympian with 13 medals (3 gold), and a six-time world champion in Athletics. He co-founded Icon Wheelchairs Inc., a successful design and engineering firm that specializes in medical mobility devices, and is in his second year of the JD program in the Litigation, Dispute Resolution and the Administration of Justice (LDA) curricular stream at Osgoode Law School at York University, in Toronto, Canada.